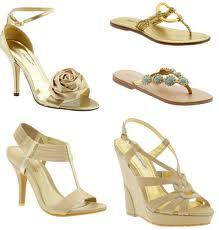 When you shop for shoes for your bridesmaids, you want something that matches and compliments the dress they will wear. 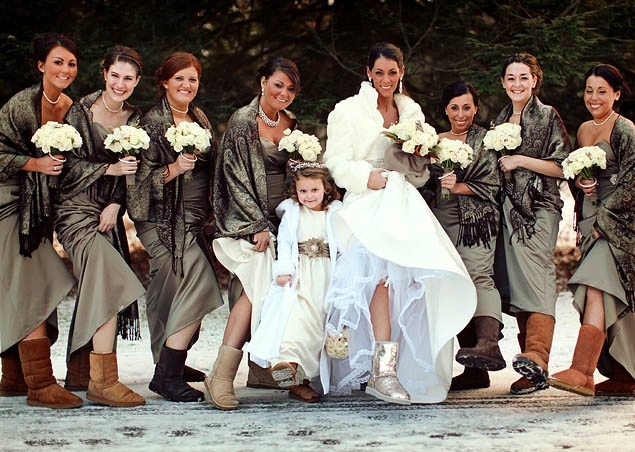 You want your wedding party to be comfortable on your special day. The goal is to find something everyone will enjoy wearing throughout the ceremony as well as the reception. If our colors include shades of pink, hot pink heels may be the choice for your attendants. You can find a variety of dressy shoes in bright shades of pink at most bridal shops as well as online at web sites including Zappos and Nordstrom. Here are 10 comfortable styles of hot pink heels. The classic beauty of this Ivanka Trump Indico pump is dressy enough for any wedding. 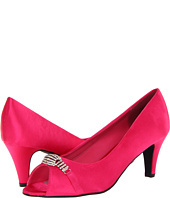 These bright pink pumps have a mid-height heel of 2 ½ inches. The foam padding under the lining provides all day comfort. The shoes have suede upper with leather lining and sole. These stylish shoes are available at Nordstrom. 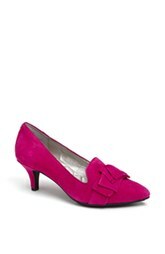 A bright fuschia pump in satin with a 3-inch heel is an ideal choice for comfort as well as style. The Bouquets Chaya has a unique vamp accent with the open side and toe. A jeweled embellishment is above the peep toe. The heel is wrapped and has a synthetic lining and the footbed is lightly cushioned. These fun shoes are available on the Zappos web site. With pretty pleats and a bow highlighting the open toe of these bright fuchsia pumps, they are an ideal choice for your attendants. The mid-height covered heel is about 3-inches. These Nina Forbes Peep Toe pumps feature a satin upper and leather sole with synthetic lining. The gorgeous pumps are available at Nordstrom. A man made sole, manmade lining and manmade footbed that is lightly cushioned ads to the charm of these chic shoes. The ankle strap has an adjustable buckle closure ensuring a proper fit. The shoes have a mid-height heel of just over 3 inches. The heel is wrapped on these bright pink Nine West Peppy shoes. You can find these delightful shoes on the Zappos web site. For casual beach weddings, the Ralph Lauren Cecilia espadrilles in hot pink are an ideal choice. The 2 ½-inch platform wedge heel provides comfort for outdoor ceremonies. The footbed and wedge is wrapped in jute for a natural look. The shoes feature a fabric upper and leather lining with a synthetic sole. These pretty shoes are available on the Zappos web site. A stunning yet simple pump that will compliment any bridesmaid dress, these beautiful Perry shoes feature a smooth pink suede upper. The comfortable 1 ¾ inches covered heel is comfortable for walking as well as dancing. The pumps have a synthetic sole and lightly padded footbed. The shoes are adorned with a contrasting blue square on the toe that adds to the elegant appearance. 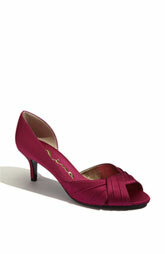 The Zappos web site carries the dressy pumps. 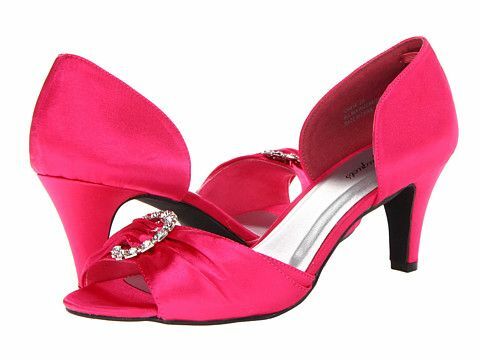 These elegant Nina Culver d’Orsay bright pink pumps feature a comfortable 2 ½-inch heel. The twisted and gathered straps around the open toe provide a dressy appearance. A cut out side design adds to the style of these pretty shoes. A padded insole and flexible outsole provide a comfortable fit. The shoes have a synthetic lining and fabric upper with leather sole. 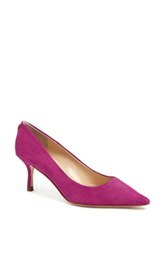 You can find the Nina pink pumps at Nordstrom stores and on their web site. A low 2 1/2 inch heel provides your bridesmaids a comfortable pump for your big day. 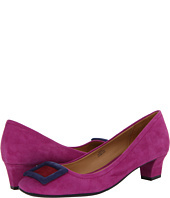 The elegant design of these bright magenta Me Too Ciara pumps features a softly pleated bow on the toe. The shoes have a slipper silhouette that compliments any gown. They have a rubber sole, leather upper and synthetic lining. You can find these dressy pumps at Nordstrom and on their web site. 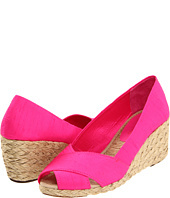 The stylish and sleek Nine West Callen sandals in bright pink feature an ankle strap with adjustable buckle closure. With a leather upper, pointed toe, and wrapped heel, these chic pumps would look lovely with any style bridesmaid gown. The sole and footbed are manmade and there is light cushioning in the footbed for comfort. The heel of these imported shoes is 3 ½ inches. You can find the fashionable pumps on the Zappos web site. The bright fuschia satin of these Bouquets Caley shines with elegance. The shoes feature a peep toe, smooth synthetic lining, wrapped heel, and are slightly cushioned for comfort. 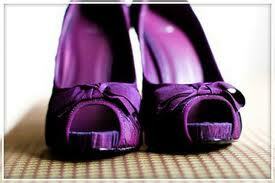 With a lower heel of 2 ¾ inches, the shoes will look lovely with any gown. A sparkly accent adorns the toe of the pumps. You can find the cute shoes on the Zappos web site.